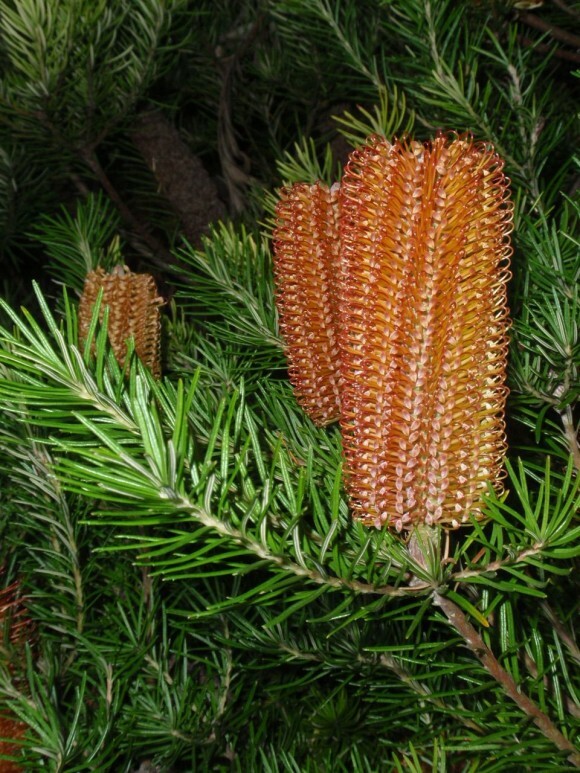 Evergreen shrub with heath-like foliage and orange-red flowers appearing in autumn or winter, native to Australia and named after the botanist Joseph Banks who originally collected Banksia ericifolia in 1770. Bright green, linear leaves, 1-3 cm long, 1 mm wide, usually with two small teeth near the tips. Erect, cylindrical, orange to red flower spikes, 7-20 cm long, 5 cm across, followed by cone-like seed-bearing structures. Individual flowers with long, wiry, hooked styles. In nature, seeds are released by fire. Prefers a sunny or partially shaded position in well-drained, slightly acidic soil. No or light pruning only to maintain shape and keep compact. Tolerates drought and light frosts. Is suitable for coastal areas, but grows only to a height of 1-2 m in exposed areas. Beautiful specimen for flower display. Attracts birds feeding on nectar. Can also be used as a hedge or a screen. Flowers last well on water.